Some moments move me in ways difficult to express. One such moment occurred on Sunday, October 15, 2017. As I walked through an area where we set out tables and chairs for people to eat breakfast and visit between worship services, I saw a Chinese family sitting by themselves. I sat down and had an enjoyable conversation with recent emigrants from China who now live and work in Enid. They've been coming to Emmanuel Enid for several weeks. As I got up to leave, I noticed two young ladies seated at the next table. They looked to be Native American. Both girls shyly glanced my way as I approached, and then they hurriedly looked back down at their breakfast. I was sure they'd overheard my conversation with the family one table over, and I wondered if the girls were thinking, "Will he stop and talk to us too?" Many Native Americans experience racial prejudice, even in Oklahoma. It's hard for American Caucasians to understand the feeling of being ignored or overlooked because of the color of one's skin or ethnic background. I did not want to convey to these girls that they were unimportant to me. People blindness is a dreaded disease I fight hard to never catch. So I stopped and greeted the girls. Both of them looked up and smiled. "Ladies, do you mind if I pull up a chair and join you?" They smiled again and said no. I pulled up a chair at the end of their table. Francesca introduced herself first. She told me she was sixteen and had been coming to Emmanuel for a few weeks. She then introduced her sister, Alice, age twenty-four. Alice said this was her first time to come to Emmanuel. "You two girls are beautiful. Do you mind me asking, 'Are you Native American?'" Alice blushed, and said, "Yes. We are full-blooded." They told me they were Cheyenne/Arapaho. They explained that their mother is Cheyenne and that their father, now deceased, was Arapaho. "Are you girls interested in your Cheyenne/Arapaho heritage?" "Of course!" they said, with what now seemed a perpetual smile. For the next ten minutes, I sat with Francesca and Alice and told them the story of the Sand Creek Massacre of 1864 and the little two-year-old Arapaho boy who had survived it. The boy, the son of an Arapaho chief, was left an orphan when his entire family was massacred at Sand Creek. He was plucked from the carnage by a United States militia soldier from Colorado named Lemuel Graham. Graham, with the help of his friend and fellow soldier Jesse Wilson, hid the Arapaho toddler in a stove for their journey back to Denver, Colorado. They hid the boy because their commander, Col. John Chivington, had issued the order, "No captives, no survivors." "The soldiers mistakenly thought the boy was Cheyenne, which is easy to do," I told the girls. "For as you know, Cheyenne and Arapaho people have similar heritage and customs." Upon arriving in Denver with their hidden captive, the militia soldiers Lemuel Graham and Jesse Wilson gave their Arapaho captive his new name - Wilson R. Graham. "What the soldiers did next with the Arapaho toddler was unconscionable," I said. The girls looked at me, wide-eyed, anticipating what would be said next. I recounted how the soldiers placed the toddler Wilson Graham in a traveling circus for their personal financial gain. 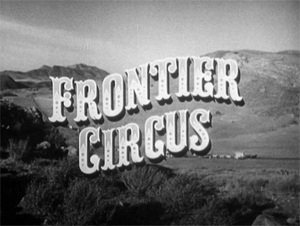 The circus went to small frontier towns throughout eastern Colorado, Nebraska, and even Missouri. Americans would pay a penny to see the "Indian savage" who'd survived Sand Creek. Wilson Graham was a circus-captive sideshow in the Wilson and Graham circus for three years, from 1864 to 1867. "The United States and the Plains Indians were at war during the entire time Wilson Graham was held captive," I told the girls. "But in 1867, when Wilson was five-years-old, this Arapaho circus boy became instrumental in bringing peace to the frontier." I told the girls how in 1867, the President of the United States, Andrew Johnson, sent the United States Indian Peace Commission, composed of high-ranking army generals and politicians, to negotiate peace with the Plainsmen Indians who'd been on the warpath since Sand Creek. "You must bring the circus boy with you." U.S. Army General William T. Sherman was commissioned by the President to use all resources at his disposal to find the circus boy and bring him to Medicine Lodge. The General who was well-known for scorching the earth in his March to the Sea at the end of the Civil War was now searching the earth to find the little five-year-old boy Indian boy. Sherman's troops found the boy in the traveling in a frontier city town and had the boy taken to Medicine Lodge on October 15, 1867, accompanied by the Peace Commissioners. "Girls," I said, drawing my story to a close, "As a result of this five-year-old Cheyenne/Arapaho boy being brought to Medicine Lodge exactly 150 years ago today (October 15, 1867) the Medicine Lodge Peace Treaty was signed." I thought it was remarkable that I was telling this story to two Cheyenne/Arapaho girls on the anniversary of the Cheyenne/Arapaho circus boy being united with his tribe. I also thought I was finished with the story, but the girls had one question for me. "What happened to the boy?" "He reverted to his Arapaho name Tom Whiteshirt and...."
I stopped talked talking when I heard the girls gasp. "We are Whiteshirts," they said. 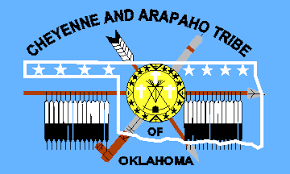 I knew that all Cheyenne/Arapaho Whiteshirts in Oklahoma descended from the lone Whiteshirt survivor of the Sand Creek Massacre. Francesca and Alice explained to me that their deceased father was an Arapaho Indian named Alfred Whiteshirt. When they'd introduced themselves to me, they'd not given me their surname. I told them that they were definitely related to the Whiteshirt who was the circus boy. Their eyes were wide, and they had more questions. They'd never heard this story before. I told them to wait right there, and I'd go print off an article for them that I'd written about it. When I came back five minutes later, the girls' mother, Mona, was standing with them. She confirmed that she was full-blooded Cheyenne and that she'd been married to their father, Mr. Alfred Whiteshirt. Mr. Whiteshirt had died a few years ago. Mona had never heard the story either, but she was ecstatic that her girls were learning about their heritage. I gave them the papers I'd printed off and told the girls that I'd really enjoyed getting to know them and looked forward to visiting with them again. After the final worship service on that Sunday morning, about two hours after I first met Francesca and Alice, the sisters came to see me. I noticed their eyes were filled with tears. Both Alice and Francesca told me that they wanted Jesus Christ to be the King of their lives. They desired Jesus to make His home in their hearts. They wanted their hearts to be God's House. As we spoke, the tears that were welling up began trickling down their cheeks. I reminded them of God's love, and how through surrendering their lives to Jesus Christ, everything they'd ever done wrong - past/present/future - would be forgiven by the work of Christ. I explained that with Jesus as the Lord of their lives, He would lovingly and patiently care for them and watch over them forever. I assured them that there was "no ritual" nor "chant" to ask Jesus to be their Lord and Savior. It was just a matter of opening their hearts to Him and receiving Him into their lives as King. Then, as we prayed, I stretched out my hands and placed them on the crowns of their bowed heads as these two descendants of Tom Whiteshirt asked Jesus Christ to be their Lord and Savior. Francesca and Alice were saved. 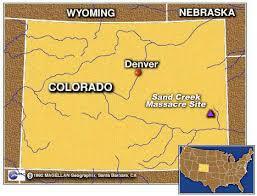 Tom Whiteshirt was saved from temporal death by a U.S. soldier at the Sand Creek Massacre. Tom Whiteshirt's great-great-granddaughters were saved from eternal death by Jesus Christ 150 years later. Francesca and Alice were both baptized on Sunday, October 29, 2017, testifying publicly of their faith in Jesus Christ. We've purchased for them Bibles and will personally encourage them as they learn what it means to walk in the grace and love of God in a fallen world where people are still being massacred. I know that Jesus saves His people (see Matthew 1:21). But last Sunday was a reminder to me that Theodore Roosevelt was right. Incredible story, but then that's expectable considering the Director Who arranged it. And it also points out the wisdom of "being there..", am I right? Great story that almost made me cry - thanks for sharing it! The details are pretty incredible. 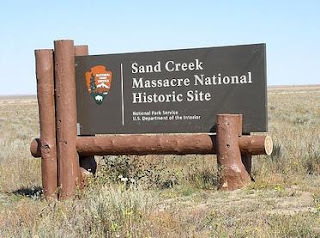 Sadly, the Sand Creek and Las Vegas massacres may share similar party involvement in carrying out the crimes against the innocent. Seems the FBI is hoping the public forgets about the event and carries on with life. Problem is too much of it was caught on footage they can't control, and too many aren't buying their ever changing story. I'm speechless. I'm emotionally moved. I'm crying. When I read your post, Wade, I think of 'providence'. That your interest in history should open a door for the sake of these two girls reminds me of some words of Chrysostom, " God calls them by the things that are familiar ". He called the wise men by a star, the fishermen by their art of fishing'"
AMEN and AMEN that souls were reaped and connected to 150 years past. Truly it is Gods' Story! Different culture, but prejudices nonetheless. Loosely based on novel written by Kathryn Stockett, she was born in 1969--Jackson, MS. Movie is fiction yet nevertheless a good movie. Wade, Look how God used your love of History and your research and writing to connect with 2 young girls, who he brought to Emmanuel, sat them beside some sweet people from another country that you reached out to. I am more and more convinced of God's sovereignty. OUR GOD IS AN AWESOME GOD!!! I was really confused for a while. I knew I’d heard about the two sisters accepting Jesus, but couldn’t find it in a previous post. The story was not in your post but in a comment you made of that post. I’m glad your post today gave much more detail that is very heart touching. I’ll give it to our SS classes. That’s right, Rex. In my previous post, I made a comment to you about the girls coming to faith in Christ. It had just happened. I went ahead and wrote a post on it. Sorry for the confusion! Let me know what your class thinks about the story! I printed 30 copies that will cover all the classes in our church. If they’re like me, they’ll have a hard time keeping tears off their faces. I should have said, 'tears of joy'. You always get the cool, goose bumpely stories!!! LOL "Prepared in season and out of season." I’ve not heard from the other SS classes, but I’ll tell you about mine. What an amazing story, Wade! I find it interesting how that God works through different means to bring people to Himself. Out of 60+ churches, these young ladies could have attended in Enid, they chose Emmanuel. 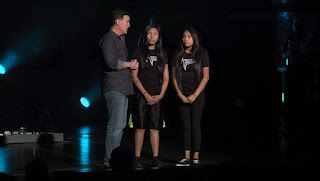 God knew that our pastor would have the knowledge necessary to make a connection with these young ladies, in order for them to be open and receptive to the Gospel. Wade you always say that HISTORY is HIS STORY. Another example of that fact, HIS STORY out of the facts of HISTORY. Awesome article! Sorry I missed it the first time it was posted. As a lover of history (and the rexamination thereof), have fillowed this story with visceral interest. Once again, Wade, you've made me weep. Your love of history was a gift from God, and you found a use for it when you spoke to those girls and shared with them the story of their peoples' history. Providence, Wade. Definitely.